I became acquainted with the Sky Islands Alliance about six years ago. A newspaper editor gave me a copy of the organizations brochure. Having been faxed several times, it was a bad copy. The best I could discern, the group was in favor of protecting biodiversity and working with the Wildlands Project. Familiar with the Wildlands Project, I wondered what connectivity lay between the two organizations. Not until an article appeared in the Albuquerque Journal, June 15, 1997, by Mike Taugher, did I realize the full extent of their collaboration. Entitled Trying to Preserve Wild Land, the article contended conservation biologists agreed steps should be taken to preserve biodiversity in our state. It claimed, islands of national parks, wildlife refuges and wilderness areas had to be expanded for the sake of numerous plants and animals. Also, according to the article, conservationists and biologists were all working together to design vast nature reserves. The Wildlands Project being the most ambitious, if not (most) radical, of the groups involved in the effort. One of the Wildlands Projects and Sky Islands first proposals was to be in southwestern New Mexico, southeastern Arizona and northern Mexico. It would be called the Greater Gila Sky Island Reserve and encompass 40,000 acres. 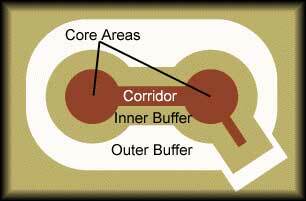 Within that acreage would be wilderness core areas, corridors connecting the core areas, with buffer zones surrounding, both, the core and corridor areas. The core areas would be designed to protect umbrella species such as, bears, wolves, bison and jaguars. In an attempt to lessen any alarm over their proposal, the group claimed land-use restrictions would not be as restrictive in the buffer zones as the core areas. The two leaders of the agenda were Dave Foreman and Jack Humphrey. Foreman, according to the article, was an Albuquerque resident who "co-founded the radical environmental group Earth First! ", during the 70s. He had, however, disassociated himself from the group when they turned into a bunch of left-wing, counter-culture radicals. Jack Humphrey was program director for the Sky Island Alliance. The article stated that "during the 60s and 70s wilderness advocates concentrated their efforts on the high mountain areas found in forest reserves. These areas were typically pretty, and attractive to users of the outdoors". As a result, wilderness areas were designated in scenic, high-altitude areas that were beautiful but not necessarily rich in trees, minerals or grazing land. Over the years these same wilderness advocates shifted their emphasis on wilderness as a place for scenery and recreation" to wilderness "as a place for preservation of plants and animals. By 1997, Foreman was heading up the Wildlands Project. Its intent, to remap (large) chunks of North American from a conservation biologists point of view. Although it had a budget of $500,000, it came mostly from grants and some individual donations. The organization was, at the time, and remains today, based in Tucson, Arizona. Jack Humphrey had affiliated with the Wildlands Project so his organization, the Sky Island Alliance, could design the biological reserves. Humphreys considered it one of the most ambitious agendas the conservation movement had ever undertaken. Although the duo conceded conservation biology's claim that umbrella species would cause other species to be protected, and flourish, the theory was largely untested. They indicated, however, the groups involved in this project had all the time in the world to test their theory. If it takes 200 years, it takes 200 years. This land isnt going anywhere, the article quoted Humphrey. Once the maps were completed, the intent was to start purchasing land, using conservation easements on private land, lobbying agencies in an effort to influence the planning process for public lands, and using congressional action to advance their agenda. Foreman felt, in some cases, it would take just a tweaking of a management plan to accomplish their purposes. As proof the Wildlands Project was a serious effort, they gave Florida as an example of how half of the states land could be used to protect wildlife. They also claimed they had an advantage in western states that didnt exist in Florida, theres a lot more public land out here, they gleefully conjectured.